You don't have to drive a hot rod or a monster truck to shop at Bob's Speed & Auto Parts. 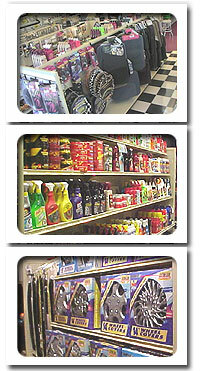 We have all kinds of accessories and car care products for everyday cars, from floor mats to seat cushions to wheel covers to waxes. Some say that your car is an extension of yourself, and our accessories selection features everything you need to make your car just that. Cup holders, trash bins, CD holders, and cell phone accessories can all help to make your car neat and organized. Decals, seat covers, wheel covers and steering wheel covers can enhance your cars appearance. Whether you drive a new car and want to take care of your investment or you're showing off a classic car, Bob's Speed & Auto Parts is the place to find the best in car care products. Our wax and cleaning section offers something to clean every part of your car from wash to wax, and from the tires to the glass. We only carry the best names, like Armor All, Meguiars, Mother's, and Turtle Wax. We have a huge selection of wheel brushes, body brushes, and other cleaning supplies to give your car's finish the gentle care it needs to stay looking its best. © Copyright 2001 Bob's Auto Speed. All Rights Reserved.